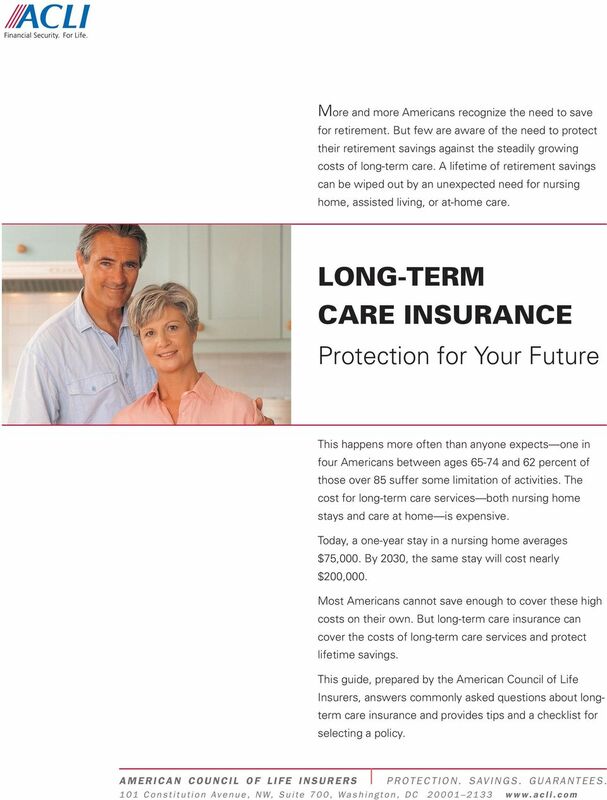 5 Long-Term Care Insurance Policy Checklist Long-term care insurance can make sure your lifetime savings and your family s financial security are protected from the costs of longterm care. 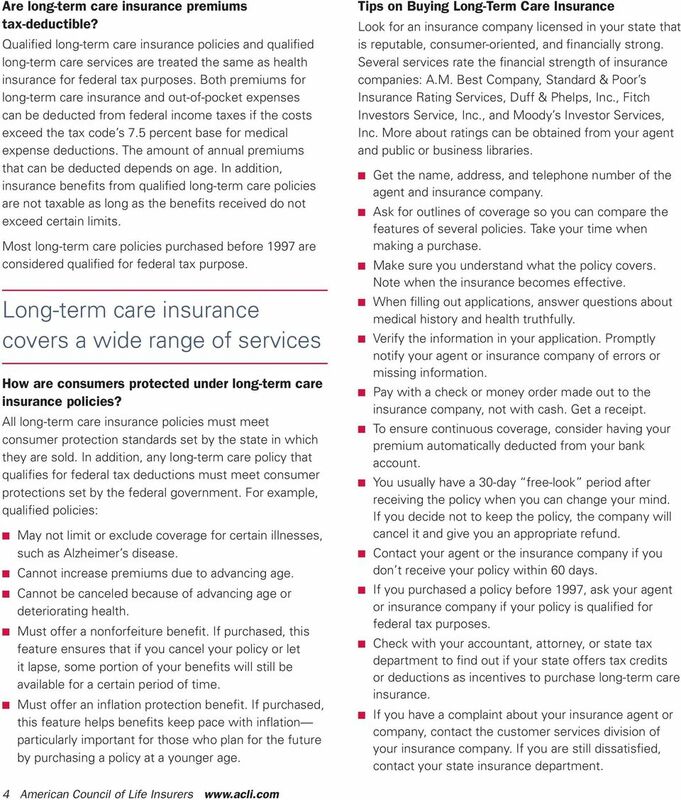 Before purchasing a policy, make sure you understand what is covered and what is not. Evaluate the policy s premiums, benefits, eligibility criteria, elimination periods, duration of benefits, and type of services and facilities covered. Compare two or more policies before making a final decision. 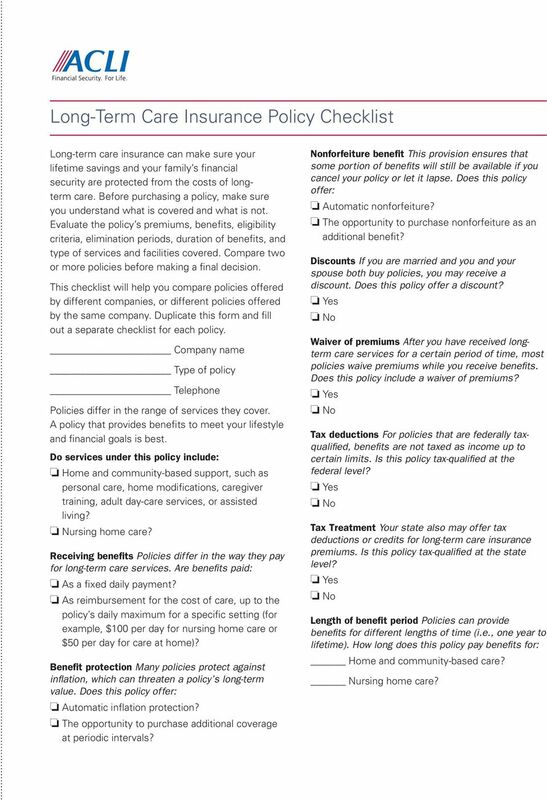 This checklist will help you compare policies offered by different companies, or different policies offered by the same company. 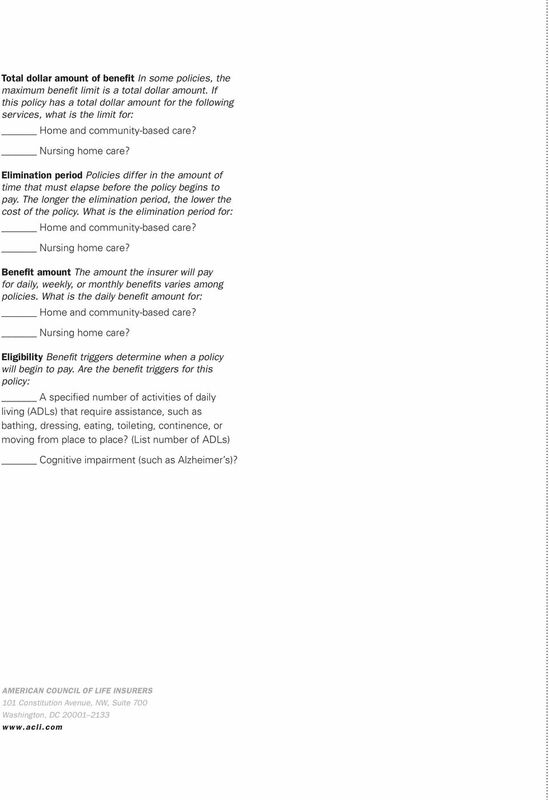 Duplicate this form and fill out a separate checklist for each policy. Company name Type of policy Telephone Policies differ in the range of services they cover. A policy that provides benefits to meet your lifestyle and financial goals is best. Do services under this policy include: o Home and community-based support, such as personal care, home modifications, caregiver training, adult day-care services, or assisted living? o Nursing home care? Receiving benefits Policies differ in the way they pay for long-term care services. Are benefits paid: o As a fixed daily payment? 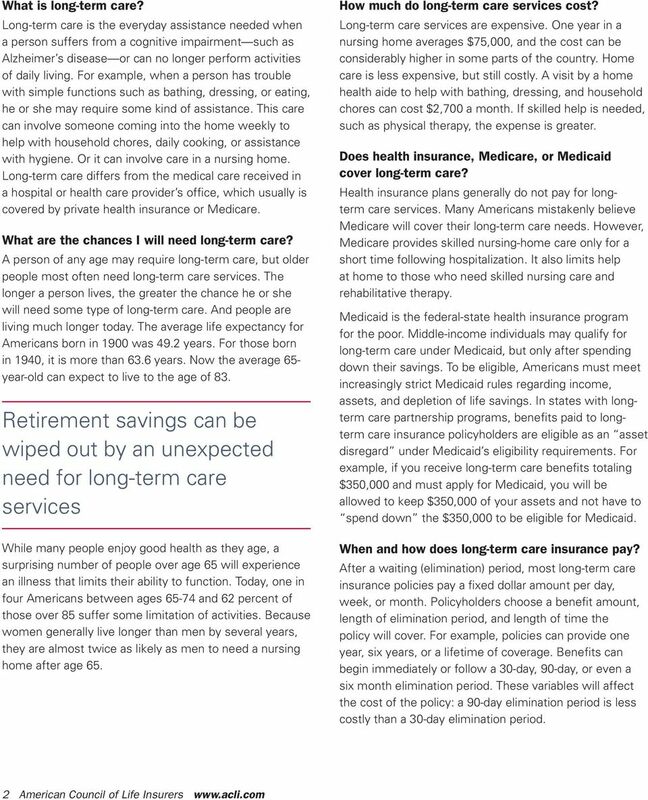 o As reimbursement for the cost of care, up to the policy s daily maximum for a specific setting (for example, $100 per day for nursing home care or $50 per day for care at home)? Benefit protection Many policies protect against inflation, which can threaten a policy s long-term value. Does this policy offer: o Automatic inflation protection? 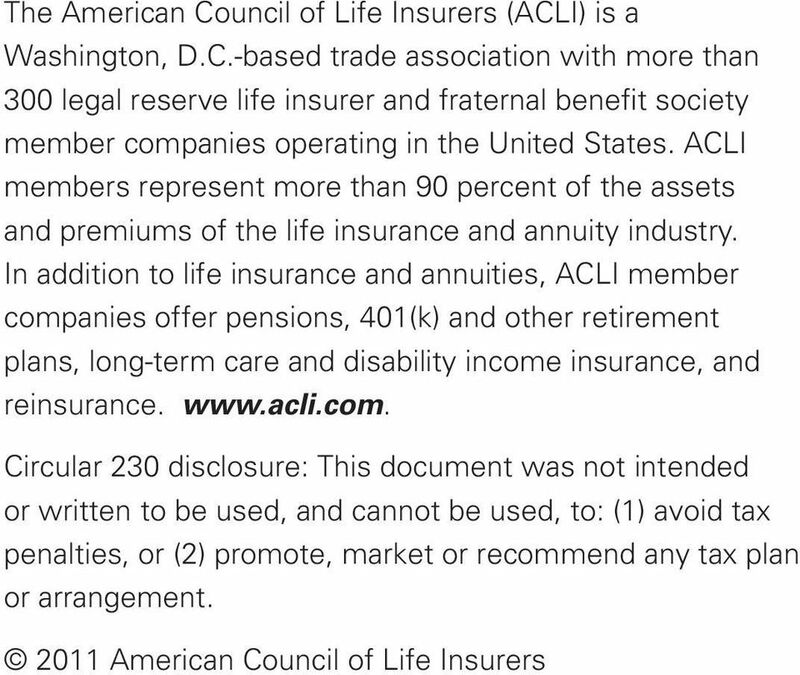 o The opportunity to purchase additional coverage at periodic intervals? Nonforfeiture benefit This provision ensures that some portion of benefits will still be available if you cancel your policy or let it lapse. Does this policy offer: o Automatic nonforfeiture? o The opportunity to purchase nonforfeiture as an additional benefit? Discounts If you are married and you and your spouse both buy policies, you may receive a discount. Does this policy offer a discount? o Yes o No Waiver of premiums After you have received longterm care services for a certain period of time, most policies waive premiums while you receive benefits. Does this policy include a waiver of premiums? o Yes o No Tax deductions For policies that are federally taxqualified, benefits are not taxed as income up to certain limits. Is this policy tax-qualified at the federal level? o Yes o No Tax Treatment Your state also may offer tax deductions or credits for long-term care insurance premiums. Is this policy tax-qualified at the state level? o Yes o No Length of benefit period Policies can provide benefits for different lengths of time (i.e., one year to lifetime). 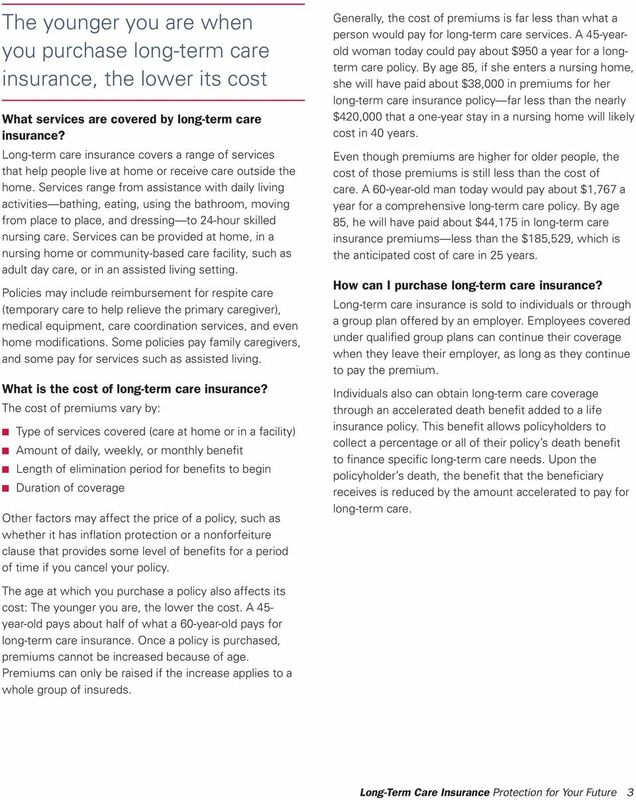 How long does this policy pay benefits for: Home and community-based care? Nursing home care? If you become disabled, disability income insurance provides money to help you pay ongoing bills and avoid depleting the savings you may have accumulated for your children s education or your retirement.